Discover all our Feng Wardorbes. 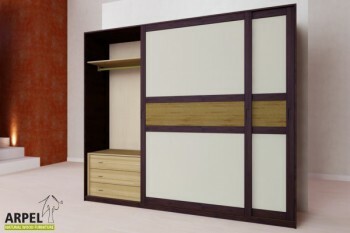 The sliding doors of these wardrobes are covered with 100% natural cotton fabric or wood panels. The harmonius lines of the Feng design are accentuated but the central wooden panels across the center of the doors. For custom dimensions ask us for a price quote. The Feng Wardrobe in lamellar beech wood with two sliding doors embelished with central wooden beams impresses for its clear-cut and elegant lines. Choose among a wide range of colors, eco-friendly finishings and modern sliding systems to create your own personal wardrobe. The Feng Wardrobe in lamellar beech wood with three sliding doors embelished with central wooden beams impresses for its clear-cut and elegant lines. Choose among a wide range of colors, eco-friendly finishings and modern sliding systems to create your own personal wardrobe. The Feng Wardrobe in lamellar beech wood with two sliding doors embellished with central fabric beams impresses for its clear-cut and elegant lines. Choose among a wide range of colors, eco-friendly finishings and modern sliding systems to create your own personal wardrobe. The Feng Wardrobe in lamellar beech wood with three sliding doors embellished with central fabric beams impresses for its clear-cut and elegant lines. Choose among a wide range of colors, eco-friendly finishings and modern sliding systems to create your own personal wardrobe.